Move in ready Craftsman style condo just a block from all of Midwood's shopping and dining. 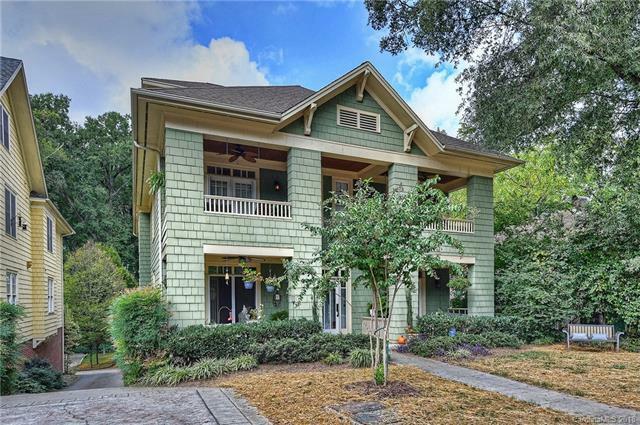 This 3 BR, 3 BA blends historic charm and modern convenience. Open floorplan. Gleaming hardwoods on the main level. Crown molding. Fresh neutral colors. Gas log fireplace. Art wall of reclaimed wood. Stainless Steel appliances and granite countertops. Gas range for the chef! Refrigerator and washer dryer convey. Master bedroom on main level is spacious and has seasonal city views. Master bath features jacuzzi tub and separate shower. Generous closets. BR 2 used as an office on the main level and second full bath. Upstairs features guest room with full bath. Watch the world go by from your balcony overlooking Pecan Ave. Tons of storage. New AC 2016, water heater 2017. Storage room on ground floor. One car detached garage with more storage. Shared community garden. Shared firepit and seating for cool fall evenings. Sold by 5 Points Realty.